The R/V Tiglax (TEKH-lah – Aleut for eagle) has been in operation since 1987. 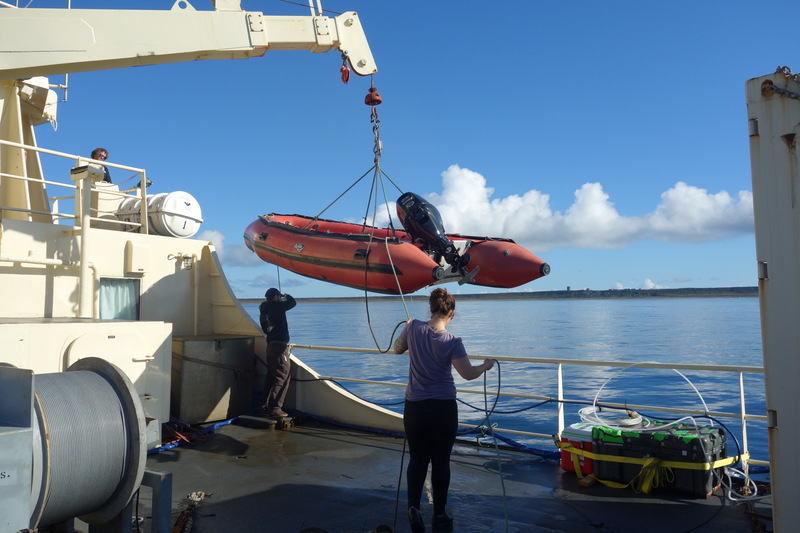 During the 2018 field season, it traversed to Seattle, Nome, St. Mathew Island in the Bering Sea, and on multiple trips down the Aleutian Chain. It supposedly logged enough miles in the Gulf of Alaska and Bering Sea this summer to circumnavigate the Earth. It is operated by the Alaska Maritime National Wildlife Refuge and U.S. Fish and Wildlife Service. The North Gulf of Alaska Long Term Ecological Monitoring Project charters the boat for about $11,000 a day. The boat itself is 121 feet long and 32 feet wide. It has two cranes for moving gear and a winch with 2000 meters of cable. The Tiglax has a front and back operating deck and a walk around on one side. Inside, the boat is equipped with a small science lab, bunks to accommodate sixteen passengers besides the crew, a galley, kitchen, a dry room for hanging rain gear and mustang suits, and a large hold for storing equipment at the bottom of the boat. The boat has its own water desalinization system, electrical generator, a huge fuel capacity, a walk-in fridge, and two walk in freezers. It can stay at sea for weeks, limited only by its supply of fresh food. The Tiglax has a crew of six. John Faris is the captain. He has worked on the boat for eighteen years, the last three as captain. John keeps tabs on all of the scientific work going on aboard the Tiglax and works closely with Russ Hopcroft, the chief scientist, to maximize what can get done on the boat with the time and equipment we have. He’s always lighthearted and upbeat, unless you forget to wear your float coat while working on deck. I appreciated that John seemed to have a genuine interest in the science understanding that his boat was contributing to. Dan, Andy, and Morgan lowering a skiff for our trip to Middleton Island. Dan is the mate and back-up pilot, running the boat on the night shift. He is a recent addition to the boat, having previously worked in marine salvage. He was full of great stories and we shared a common distaste for the night shift. Andy is the ship’s engineer. I never knew where he was, down in the engine room somewhere maybe, but when things broke, which they did, he was always on it. Despite having blown a hydraulic line on the main crane, and having seriously taxed the aging winch, we only missed out on one tow in fourteen days. There are two shifts on the Tiglax. The night shift operates from 10 pm to 6 am, and then again from 2pm to 6 pm. The dayshift runs on the opposite hours. There are two deckhands to staff those shifts, Dave on the day shift and Marin on the nightshift. Dave and Marin have both been with the boat for a few years, and seemed to enjoy the life that an intensive six-month season provides. Dave keeps a van in Arizona, and is looking forward to some desert therapy after a long season spent on the cold water of the Gulf. He was patient when I lashed things down poorly and always offered up a smile when I reached zombie status at the end of the night shift. He also taught me that the phrase “make sure the dog is in the clover,” doesn’t have anything to do with a four-legged animal or a plant (my bad), but rather meant I was supposed to put the metal tie down hook (dog) in the clover-shaped tie down slot (clover) on deck. Marin at the winch controls. Marin grew up commercial fishing and is pretty much super woman. She could move heavy equipment as well as any man on board and run the crane with a delicate touch, all while making a float coat and Grundens rubber bibs look stylish. Marin does some other gigs during the winter, including work as a professional climber cleaning tents for Cirque du Soleil. This type of cruise is not the main function of the Tiglax. 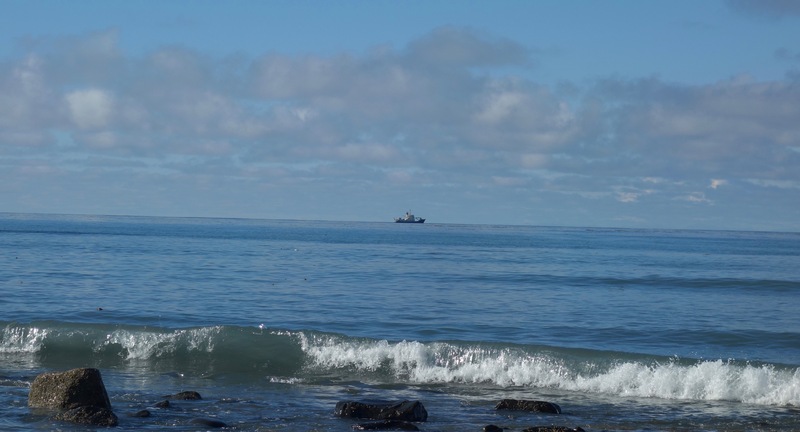 For much of the summer the Tiglax is bringing scientists to, picking scientists up from, or resupplying study sights in the Aleutian Islands and Bering Sea. The Tiglax is really a scientific taxi service and hotel. Our work, by comparison, is certainly repetitious if not dull. Running a deep-water plankton tow or a deep cast of the CTD typically means two hours of standing at the winch controls. The deck hands will run the winch for those casts and tows over one hundred and twenty times during the length of this cruise. Hardworking oceanographers have got to eat, and Morgan is key to that. Morgan is the ship’s chef; three times a day, she plans and prepares meals for twenty. She is amazingly efficient in the kitchen, and always playing great music. The rest of the crew thinks she has the hardest job on the ship. Although fresh vegetables got a little hard to find, the food was always excellent. Working just six months a year on the boat, she runs a private catering company the rest of the year. She talked to me about the challenges of running a growing small business when you are so remote for so much of the year. The entire crew lives in the town of Homer, the boat’s home port. They seem to enjoy their jobs on board the Tiglax as well as the exotic places it took them. What’s it really like being at sea? 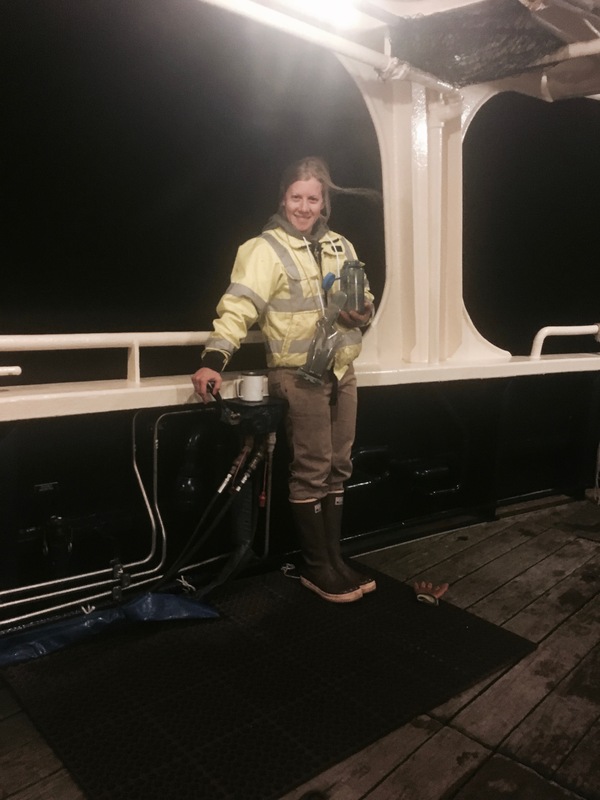 Being on board a small research vessel at sea is a series of sharp contradictions. The boat can go anywhere, but you can’t go anywhere. You are in an incredibly remote and exotic location, but your day is totally routine. When working, you are constantly busy, but when you aren’t working, there are few distractions and time moves slowly. Look out at the horizon for an hour and you may see nothing but water and sky, but then in an instant a fifty-ton fin whale surfaces right in front of the boat. You are traveling though places completely devoid of human noise, but the ship itself is a constant cacophony of sound. When the boat moves completely out of sight of land, there is a visual blandness that lays in contrast to the thrill of the living things that populate the absurd depths below you. If you want to open a door on a boat at sea you first have to unhook it. All doors and shelves have hooks to keep them from flying open or closed. 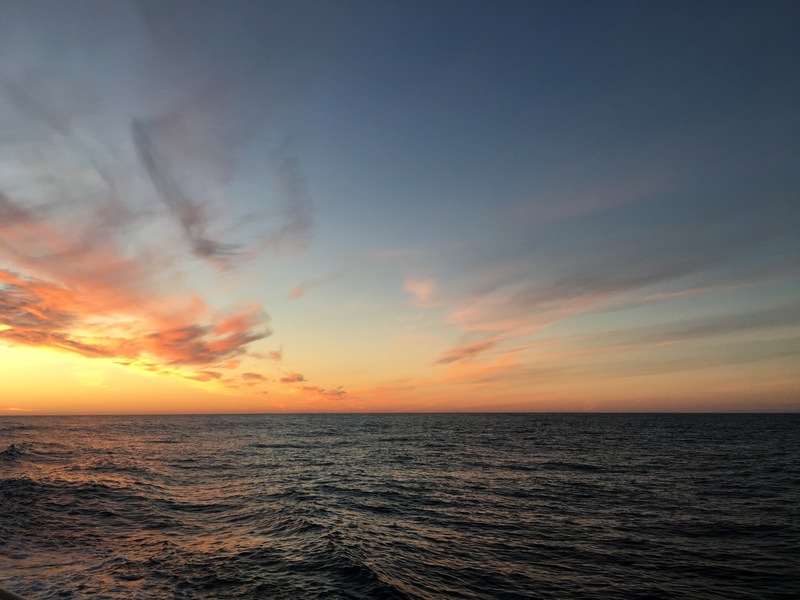 This entry was posted in 2018, Mark Van-Arsdale, NOAA Teacher at Sea and tagged Alaska National Maritime Wildlife Refuge, Long-Term Ecological Research, North Gulf of Alaska, R/V Tiglax. Bookmark the permalink.